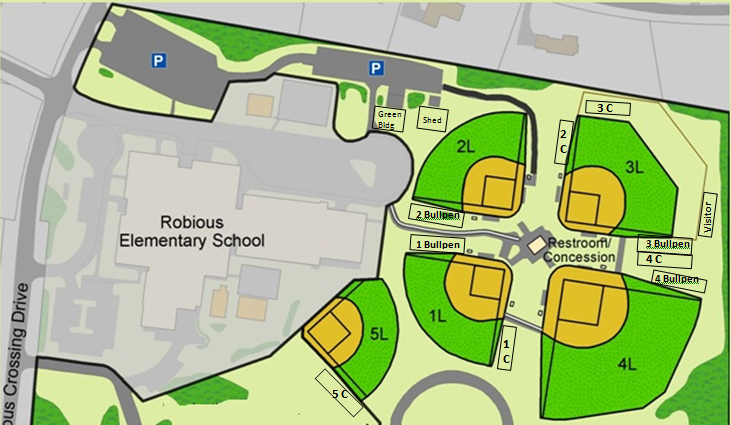 Robious Complex batting cages are the property of Huguenot Little League (HLL) and are reserved for HLL participants and tournament visitors only. Teams with games are assigned by their respective HOME or VISITOR designation. PRACTICING teams are assigned corresponding cages for the entirety of their practice. If you are in a batting cage that is not assigned to your team or time and correct team arrives for batting, please vacate the batting cage immediately! Cages are reserved for teams playing on respective fields 1 hour before game time. Visitors = First 25 minutes starting 1 hour before game time. Home = Second 25 minutes starting 35 min before game time. For the diagram below, the cages are marked with the corresponding Field # (C=Cage).